This impressive antique Georgian sterling silver tumbler cup has a plain circular rounded form. The surface of this George II cup is plain and unembellished. 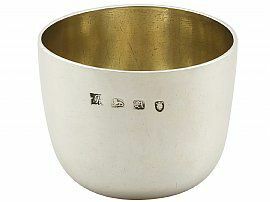 This sterling silver tumbler cup retains the original gilt interior. This fine antique tumbler is a very good gauge of silver, very good quality and in excellent condition. The gilt to the interior is in excellent condition considering the age of this piece. Full hallmarks struck to the surface of the cup are all very clear, considering their position and the age of this piece.